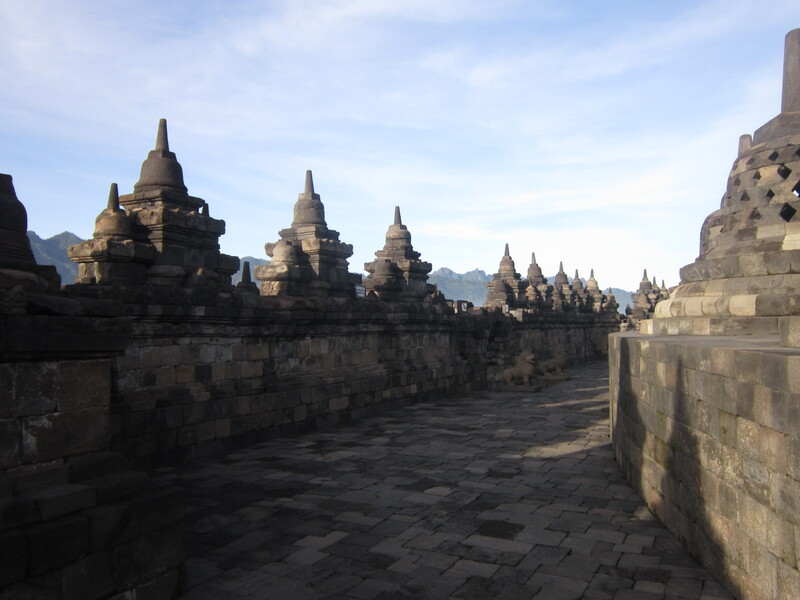 Despite everything I just said about Bali, Yogyakarta was my favorite out of the three places I visited in Indonesia. Perhaps it’s because I had more freedom to explore and spent less time in cars, or perhaps because it was more than what it was marketed to be, but I really enjoyed my two days there. Before I go any further, let me help you pronounce it. The y’s are pronounced as j’s. Now, see? Isn’t that much easier? 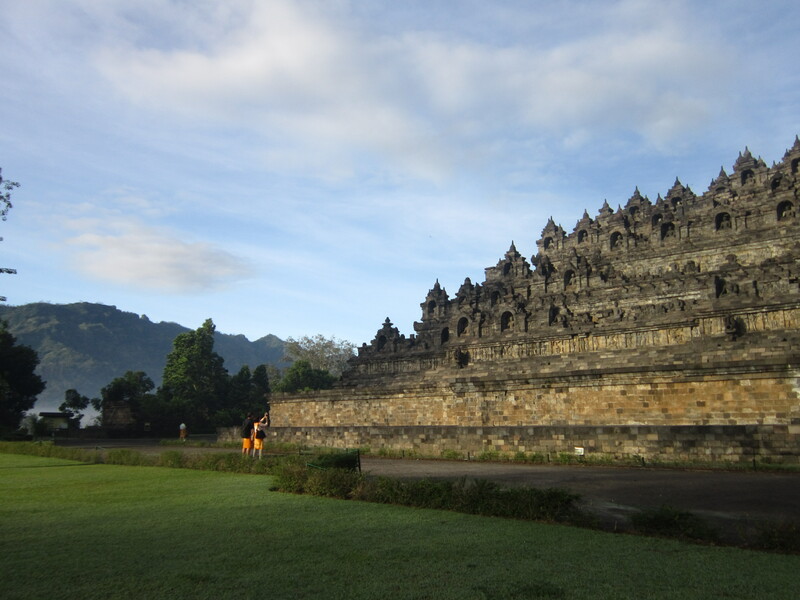 If you want, you can even call it Jogja. My first day, I caught up on sleep. I was tired from the conferences and from early morning flights. I felt guilty, being in such an interesting place just sleeping, but I was alone, so I did as I pleased. 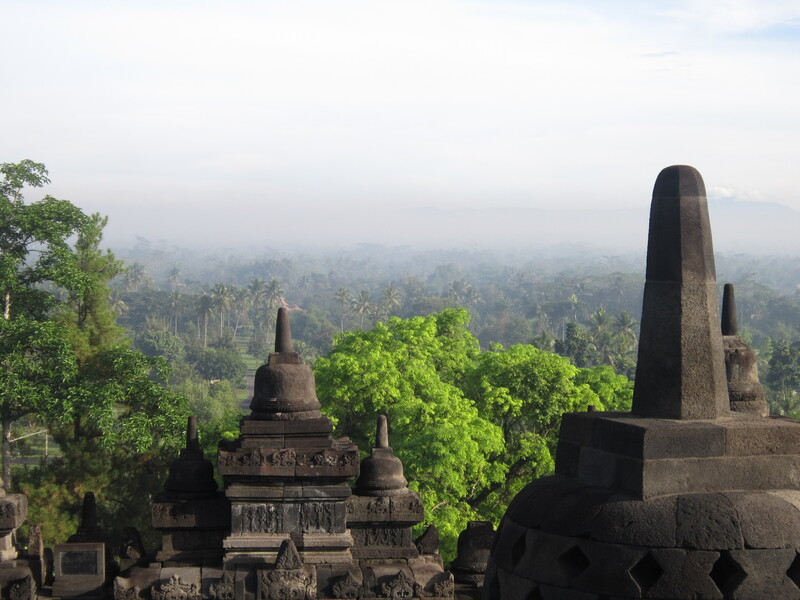 After I got up, I watched about an hour of Indonesian TV in my hotel room just because. Then around lunchtime, I emerged from my room to find food. I found a place a little ways down the street that served basic rice and noodle dishes and ordered nasi goreng (fried rice). For about 30 minutes after eating, I just sat watching the television in the restaurant. The program looked really interesting even though I didn’t know exactly what was going on. And I like watching people responding to their own television series. 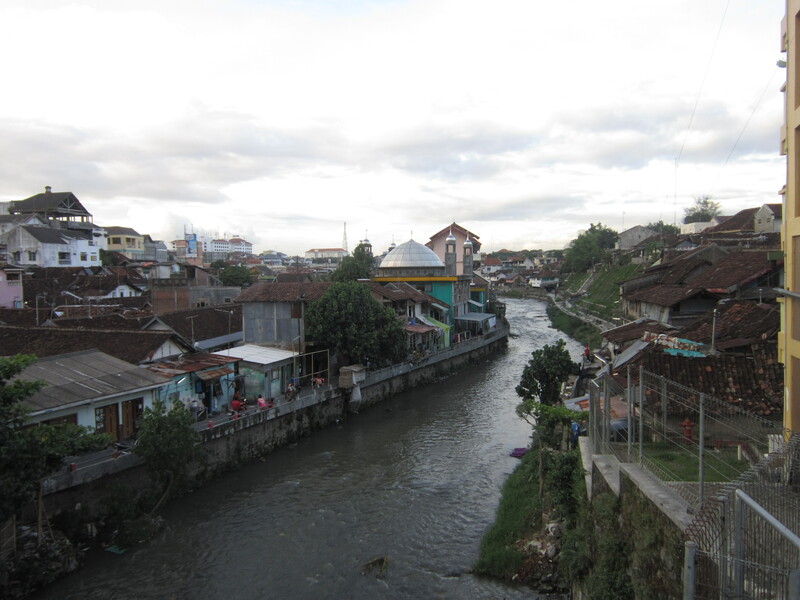 In Yogyakarta, they have two main transportation options for those without their own vehicle looking to get around town: the becak, and the andong. The becak are bicycle taxis with the bicycle at the back. 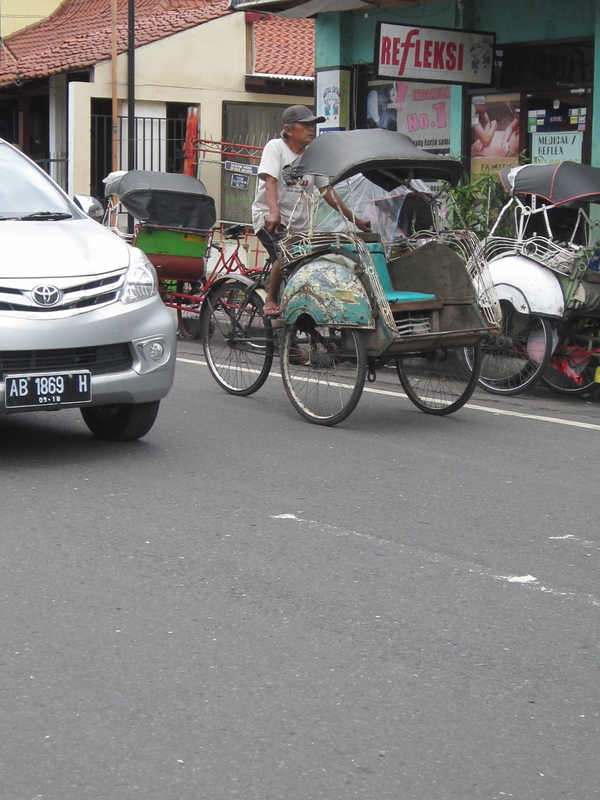 I enjoyed taking the becak around town and especially enjoyed when they went top-down convertible style in the evenings. 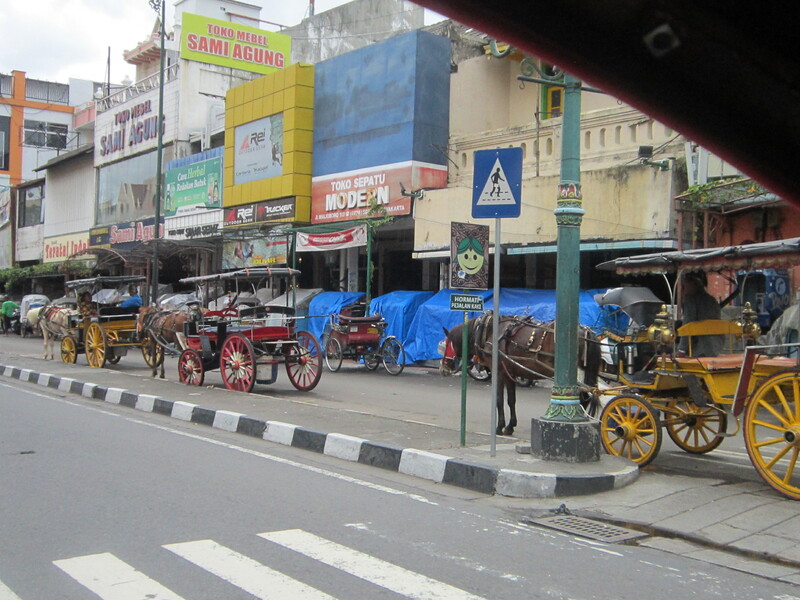 The andong are horse-drawn carriages. 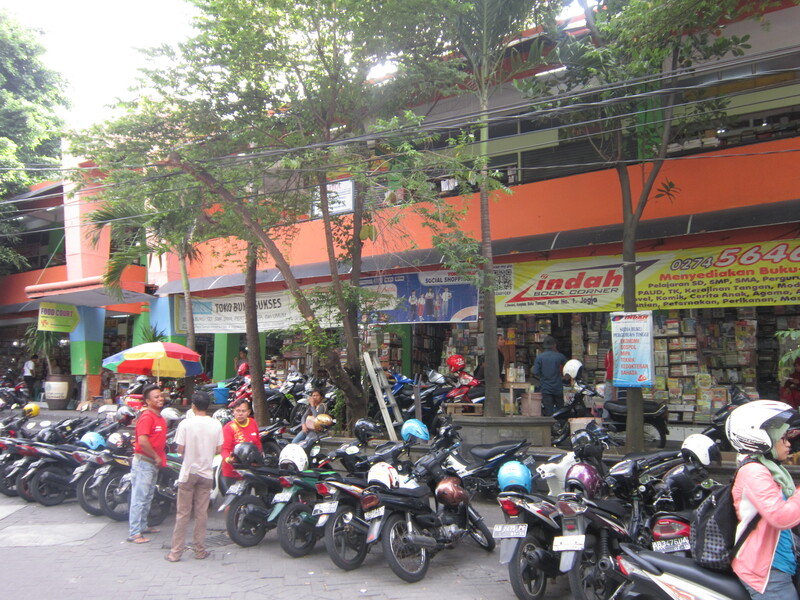 Andong on Malioboro waiting for customers. I decided after lunch to go museum hunting again. 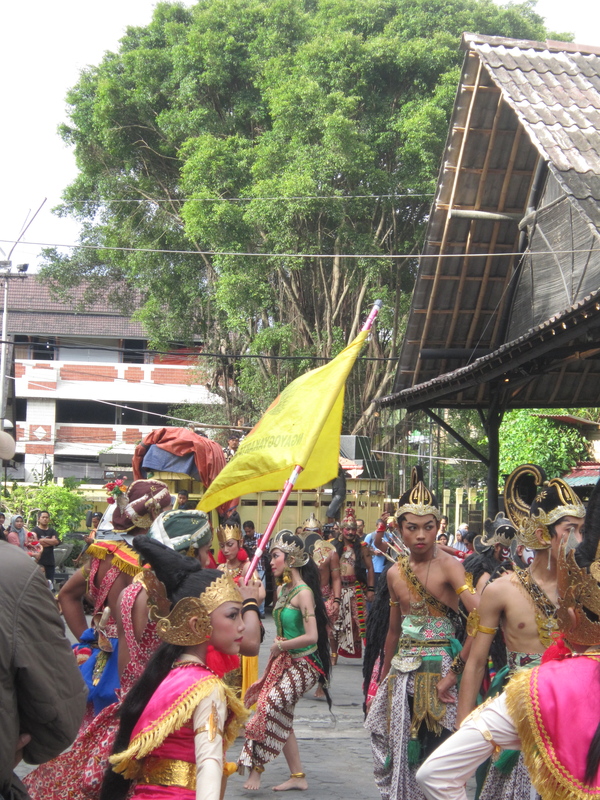 I had exchanged cards with a guy at the conference in Bali who was the director of a wayang (puppet) museum in Yogyakarta. 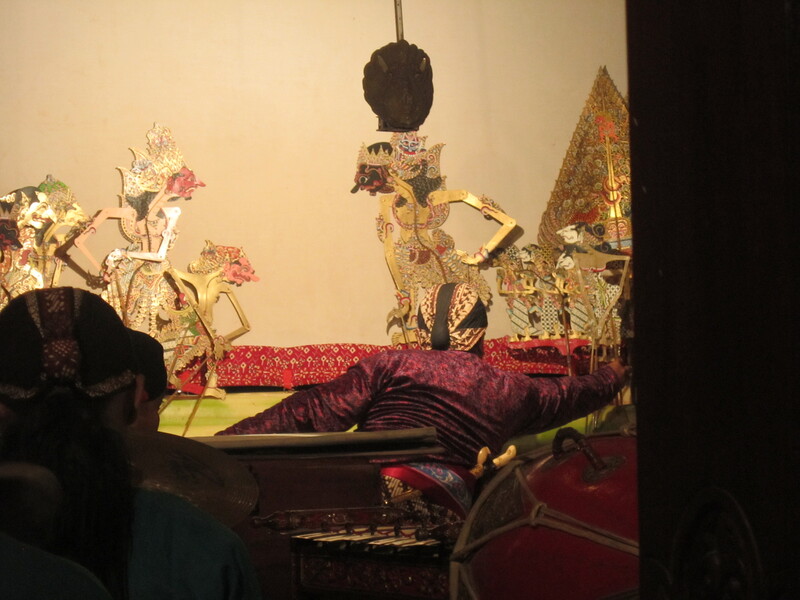 I showed the card to a becak driver and said “Saya mau ke museum wayang ini” pointing to the card. I hopped in and we set off. He appeared to know where he was going—they all appear to know where they are going at first, I suppose— but after a certain point we stopped for directions. Then we stopped for directions again and again. Finally, after stopping at several places, we arrived—at the museum director’s house! He had put his home address on his business card?! No wonder no one knew what we were talking about when we asked for directions. We weren’t anywhere near a puppet museum. The director greeted me and suggested I go to Museum Sonobudoyo. 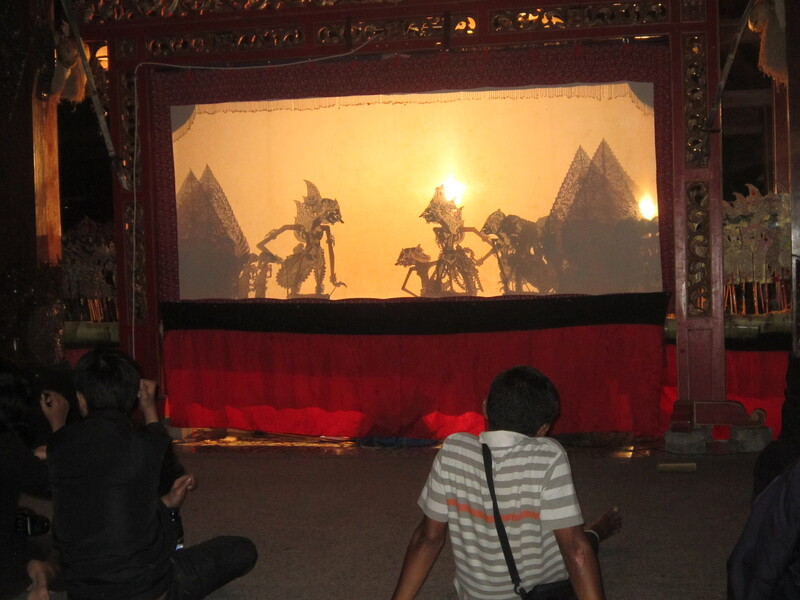 He also reminded me that there were free wayang performances Friday nights at city hall. And I was fortuitously there on a Friday. 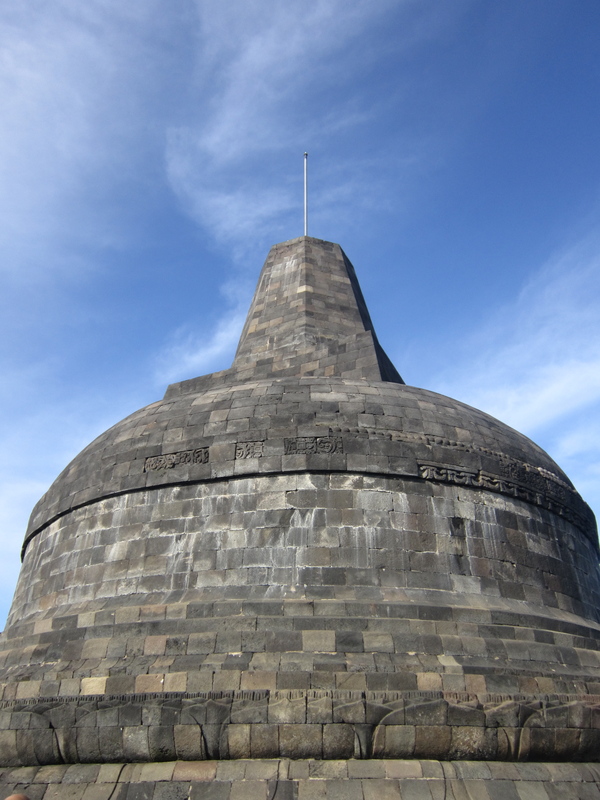 I checked out Museum Sonobudoyo and had a great time there! 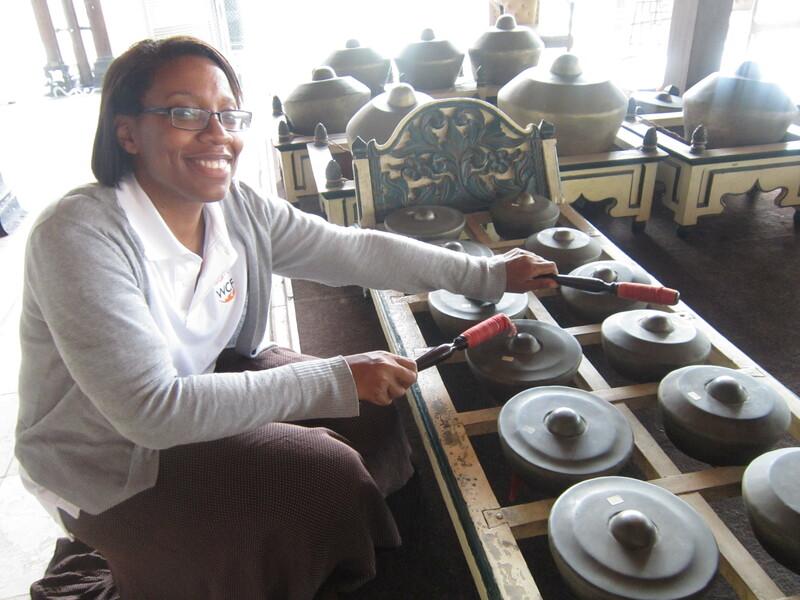 I got a free tour guide who played the gamelan for me and let me try playing as well. He showed me around for about an hour and I got to ask lots of questions. At the exit, someone directed me off to the left where I could see puppet makers so I went over and had a look. 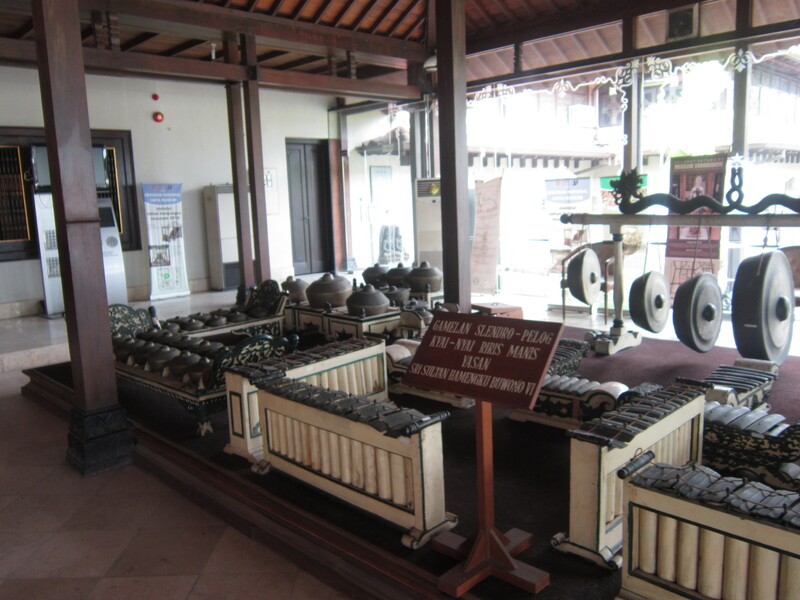 Gamelan at the entrance to Museum Sonobudoyo. Puppet maker working with buffalo hide. Puppet maker painting the hide. My becak driver took me back to my hotel and I wondered what to do for dinner. Only then did I remember the Indonesian restaurant in Seattle that I had often eaten at and checked online to see if I could access their menu. I wrote down the name of my favorite dish, showed it to the hotel receptionist and then headed to supposedly the best place in town to get it. The same becak driver took me to dinner and connected me with his friend who could take me to the temples the next morning. You probably already know well that I am a noodlevore: a voracious lover of all noodle-based dishes. 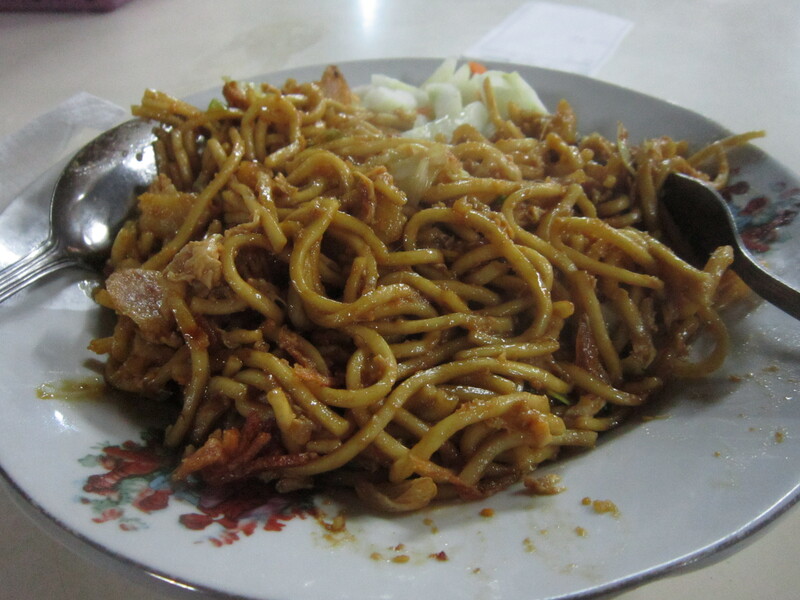 Nasi goreng was never going to win my heart, but bakmi goreng jawa might. I arrived at a very local looking place, figured out the song and dance required for ordering, and then waited for my stir-fried Javenese noodles. They were good, not amazing, but I’d eat it again for sure. 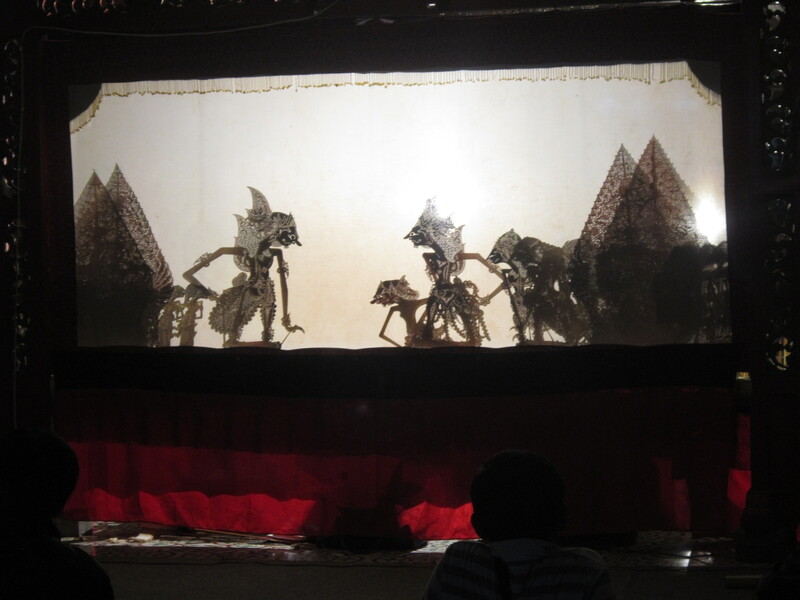 After waiting with fading hopes for almost an hour for a taxi to city hall, I finally got one and made my way to the wayang performance. 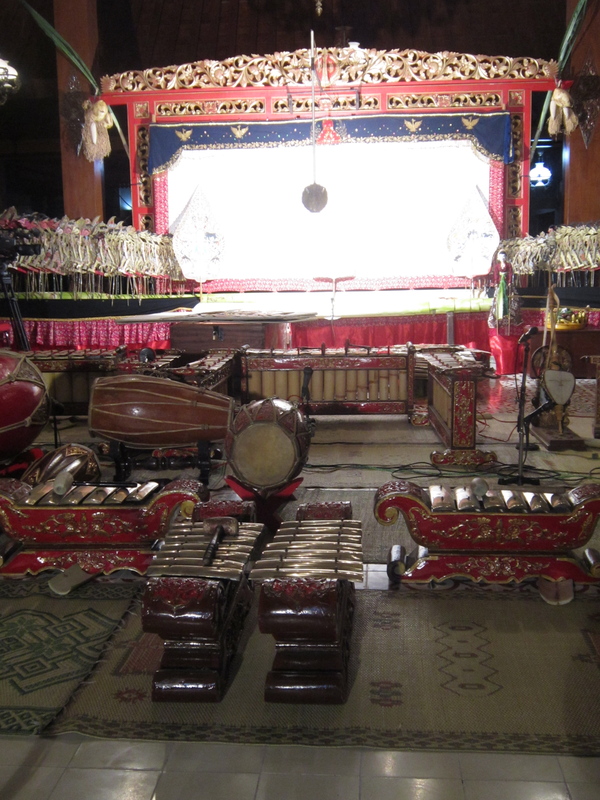 Traditionally, these performances go from 9pm to 4am. I didn’t stay that long because I was still tired and had an early morning the next day, but I stayed for about an hour and a half. Most of the time, I sat on the same side as the ensemble where there was a little less shadow and a lot more puppet. So, before leaving, I walked to the other side to see what it was like from the audience side. The atmosphere was really casual. People sat on the floor chatting with friends, some watched while others just saw the puppet performance as a backdrop for a late night social gathering. 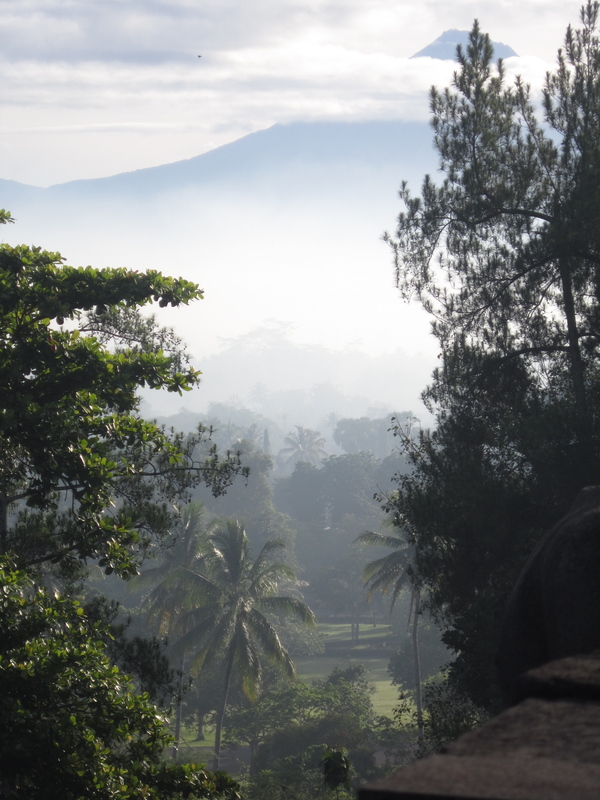 The next morning at 4:30am I had to meet the driver to go to Borobudur. 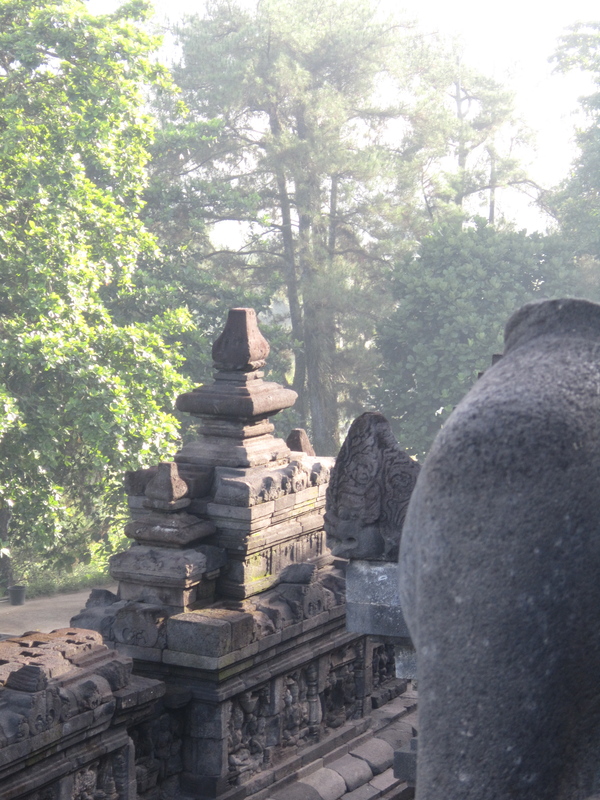 He had said if we left then, I could see the sunrise over the temple. In reality, I could already see the sun rising out the back of our van! I ended up missing the sunrise, but also missing the sunrise crowd. Even still, things were about to get crazy! 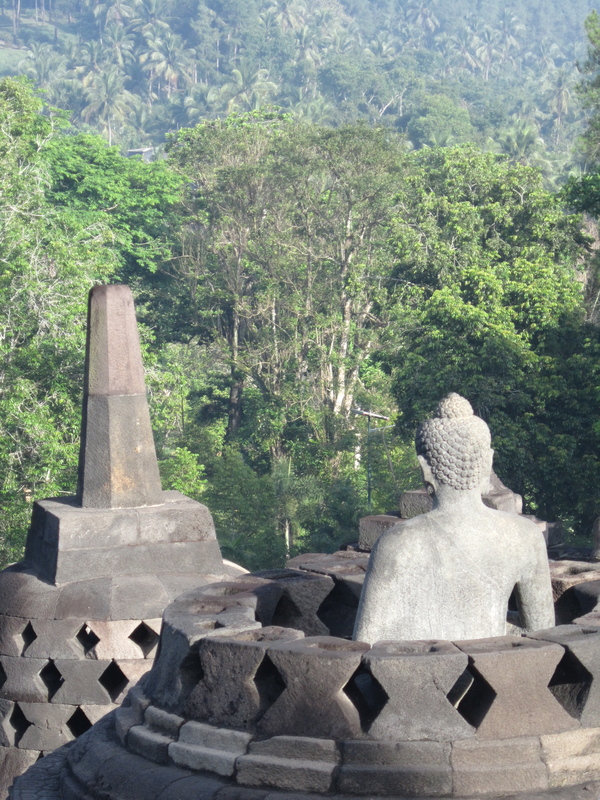 So, I’m standing by the foreigner entrance to Borobudur with some blonde German women. Over the course of 10 minutes a few other white people with light hair trickle up. 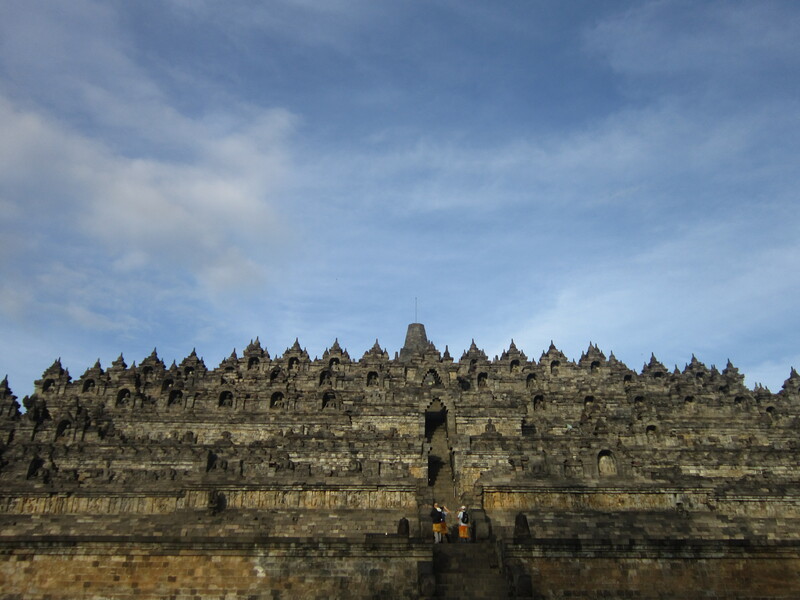 I spy the entrance for Indonesians over yonder and see the tour groups arriving with all the fanfare that accompanies large tour groups—megaphones, flags, color-coordination. Now, I am quite used to having my picture taken from my China days; being followed, being posed, being stared and gawked at, these things were normal. And, to be honest, I didn’t really mind the attention. 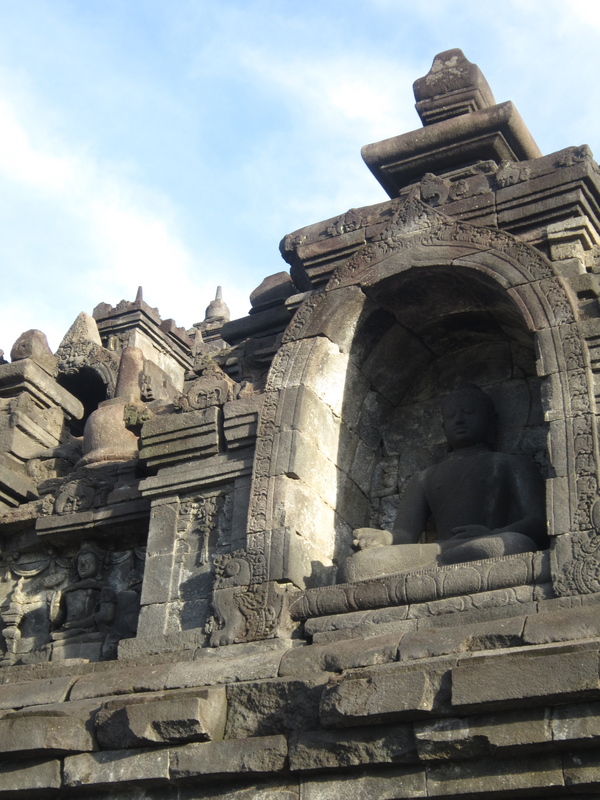 I had heard from a friend though that during her recent time in Jakarta, she hated always being cornered and asked for photos. I thought it couldn’t be much worse than what I went through for three years. 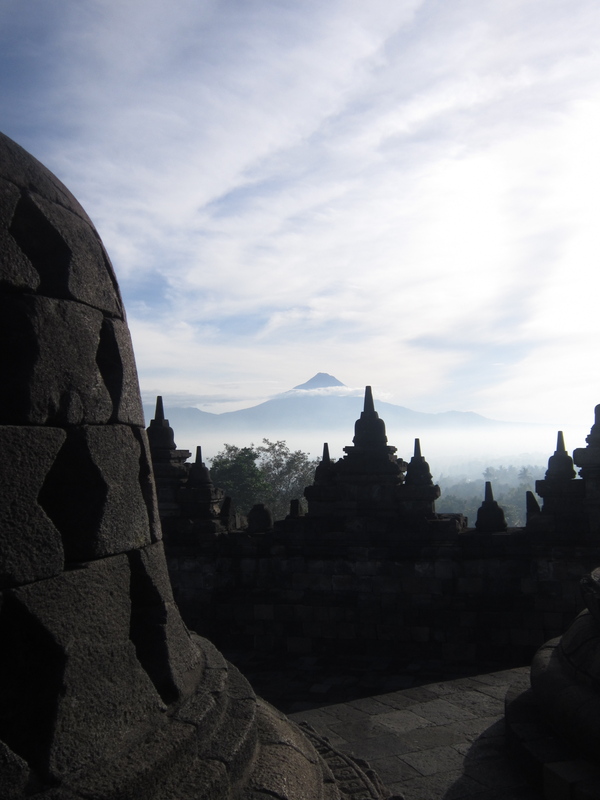 Well, on that morning for breakfast at Borobudur, I ate my words. 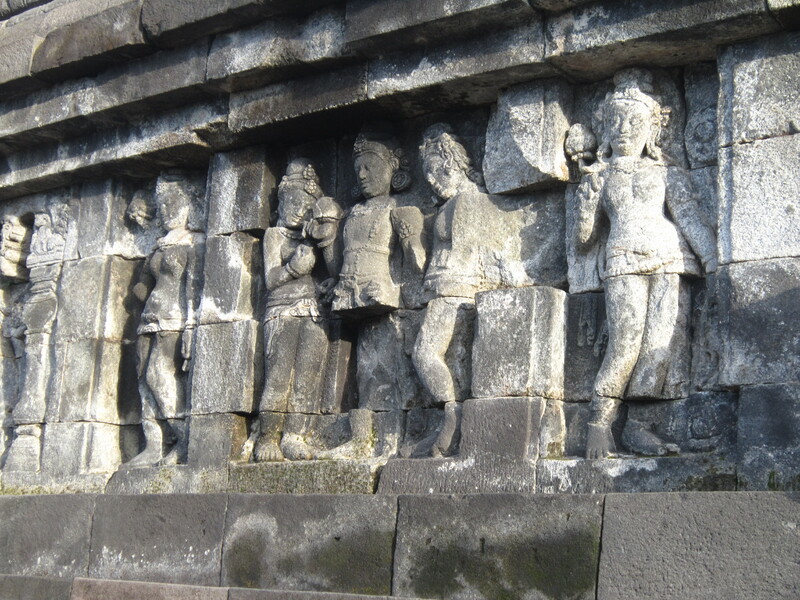 I would say that these people were crazy, but I know that’s culturally insensitive. But no, actually, they were. Not across the board. Not about everything. But when it comes to white people? Crazy. I have never seen anything like it. In groups of upwards of 15 people, they’d walk over all with their cameras to approach people for pictures. Yes, they asked before hand. But each of the 15 people asked. Then took a photo with their own camera, then took a photo of each of their kids with the white person, then with all of their kids and the white person, then with the whole family and the white person, and then the tour leader would take video of it, then the white person was passed on to the next adult. Every time a new white person would walk up, they’d be approached. Every time a new tour group arrived, they’d make their way over. Everyone in the group walked away with every possible configuration of photos. It was shameless and it was selective. This black girl? What black girl? The brunette white woman, invisible too. The overweight white woman, undisturbed. Just the white, blonde, skinny women. And that to me was what made the difference between it being a mere matter of curiosity to one of worship. To me, that was tragic. I felt much worse for them than for the white people being badgered for a photo like they weren’t even people. 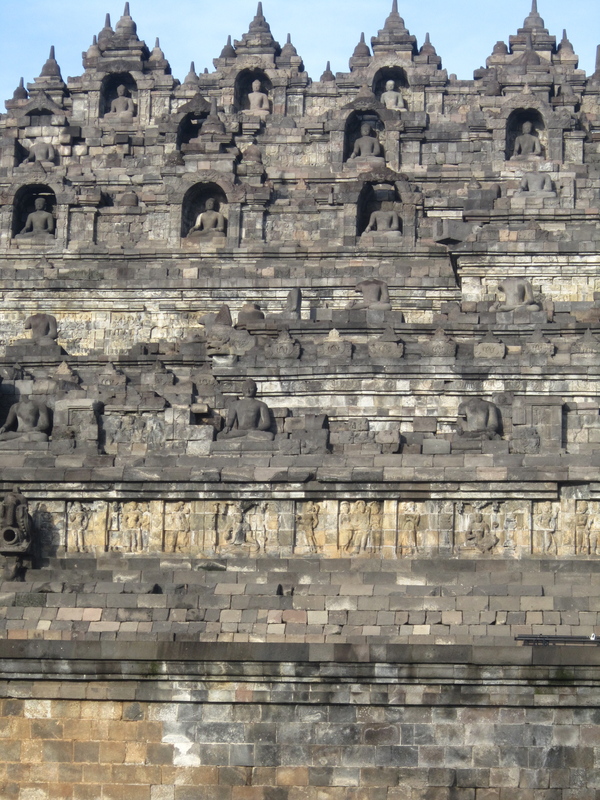 After about 15 minutes, the gates opened, the crowds dispersed, some thankful for their freedom and others for giving them The Shot of a Lifetime #57, and I entered the world’s largest Buddhist archaeological site. After walking around I went back to the parking lot but I couldn’t find my driver! I shouldn’t have been surprised, I wasn’t even sure I was in the right lot and couldn’t even remember the color or make of the van. Was it a van? Was it an SUV? Was it black? I couldn’t tell you. 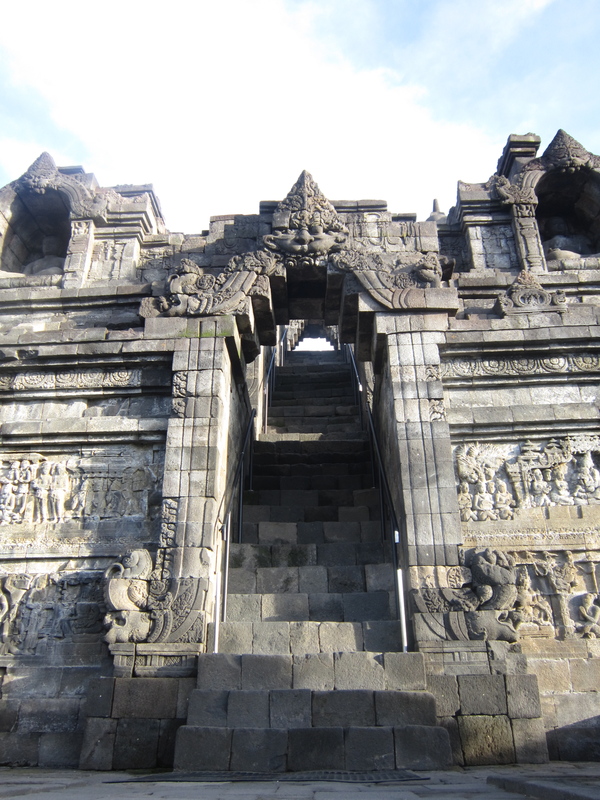 I didn’t have a phone (forgot it back in my room in LP) and after walking around in circles I…bought some chips, sat on a curb, and tried to remember by looking at photographs I had taken while waiting for the temple to open. Someone walked by with a phone and I asked if I could use it. She called my driver and then said he would come here. Ha! I was basically sitting in front of the car (van? truck? whatever…) separated only by a row of food stalls. I got back to my hotel around 9am. Slept some more and then started exploring by foot. So happy to be walking around! 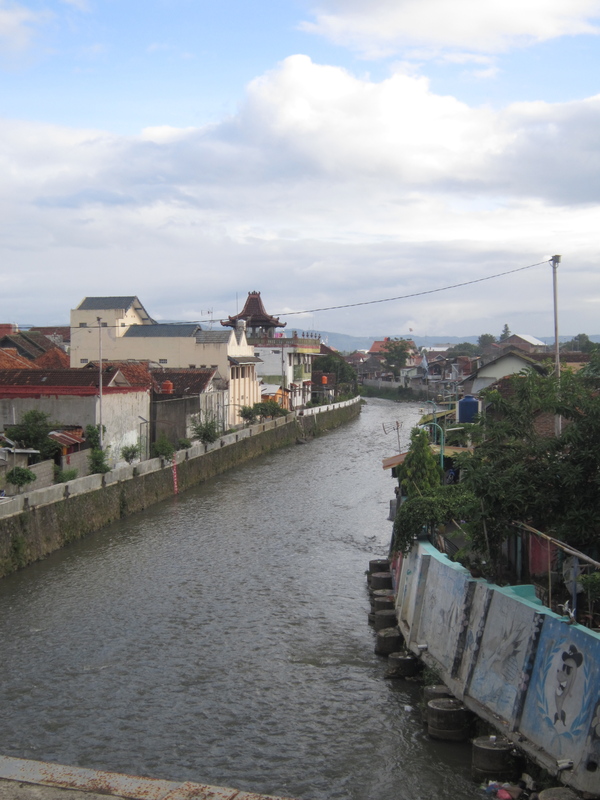 I was on the hunt for two things: street art and bridges, both of which I had seen from my becak the previous day. While walking down Malioboro looking for a t-shirt for a friend, a man stopped me to comment on my scarf (from TAEC!) then asked me where I was from. When I told him America, he asked if I was from Seattle. I found it an odd follow-up question, but whatever, he had relatives there. His sister and her husband Mike (John? Chris?) and their two kids *this* tall and *that* tall. I had to let him down and confess I didn’t know them. 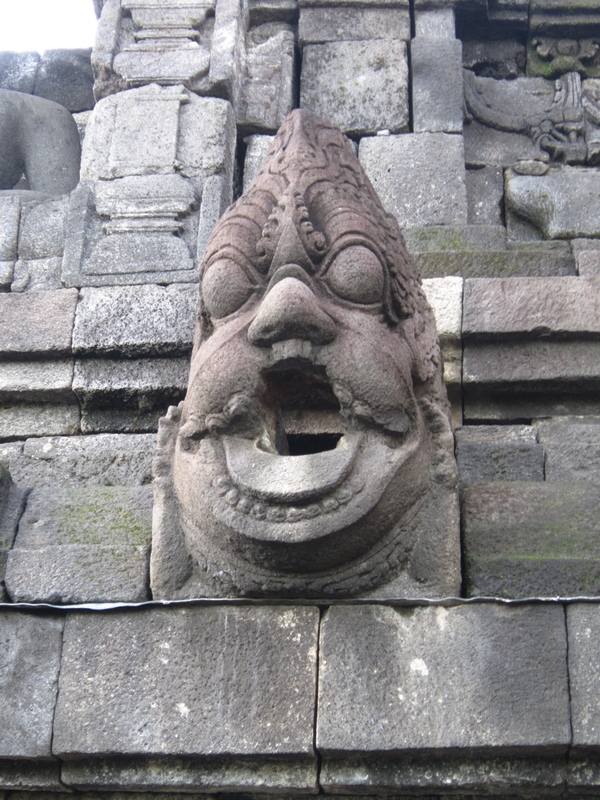 “Do you like art?” was his next question, and before I knew it he was leading me to a batik art exhibit down the road and up a deceptively shady set of stairs. His wife was an artist and was exhibiting work at the show. He deposited me into a room filled with batik art and showed me his wife’s stuff before running off to meet her for lunch. It turned out to be pretty cool. An art teacher came out and talked to me. 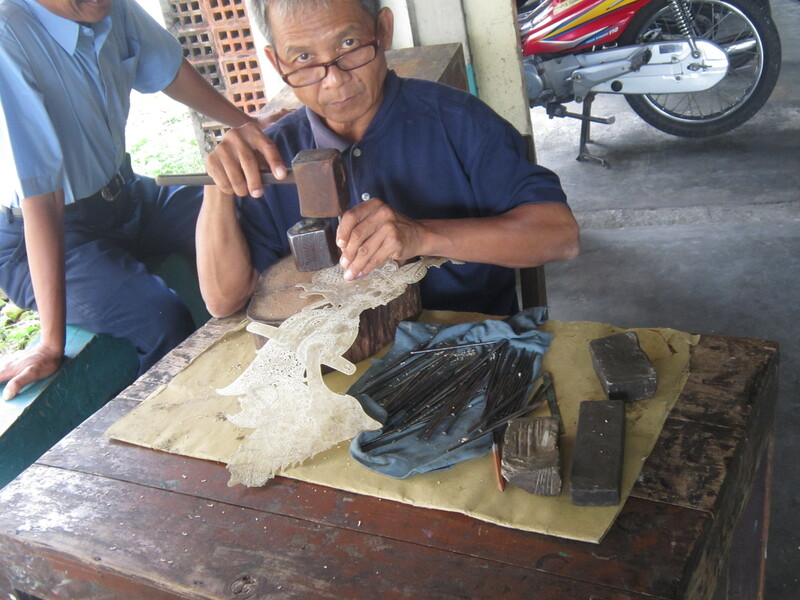 He showed me all the different steps involved in making batik and let me see the different kinds of wax that they use. 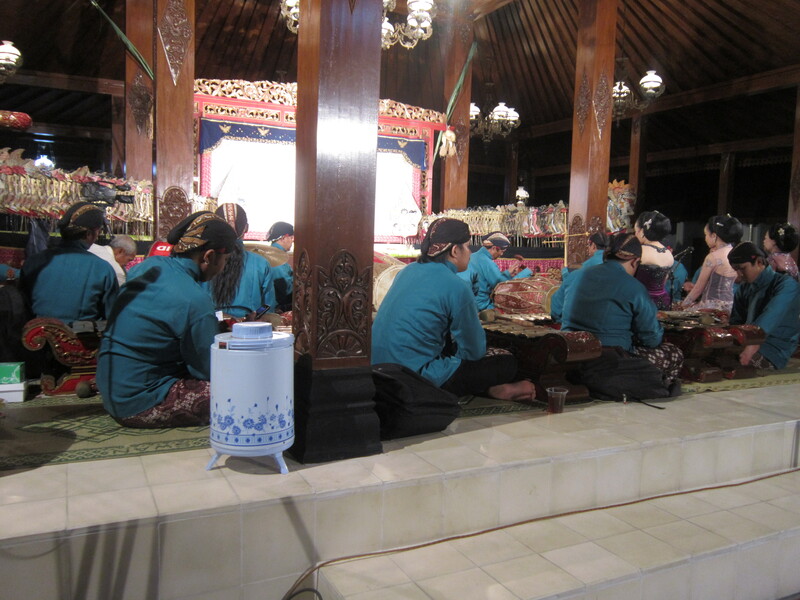 He explained that the word batik is Sanskrit. Ba means line and tik means dot. After about 10 minutes of explanation and small talk, he asked which paintings I liked best. Each one I picked out was his! What good luck. He showed me if I were to buy one how to mount it on the wall, what color frame looks best, what kind of lighting to use. There were so many that I liked. Unfortunately, he did not allow photos but I did end up buying one, so I have a photo of that. It hurt my budget a little, but I think it was worth it. I bought it straight from the artist! I got lunch and then continued walking. I stopped at a busy intersection across from the post office and sat on some benches. For about an hour, I watched friends gather, tour groups pass, kids in school uniforms being kids with each other, a man making repairs to a gate, a woman selling trinkets. I actually bought cotton candy and just sat there under my umbrella (it was raining on and off) watching people interacting with each other. It was really lovely to have time for this! My day was filled with so many surprisingly satisfying discoveries. 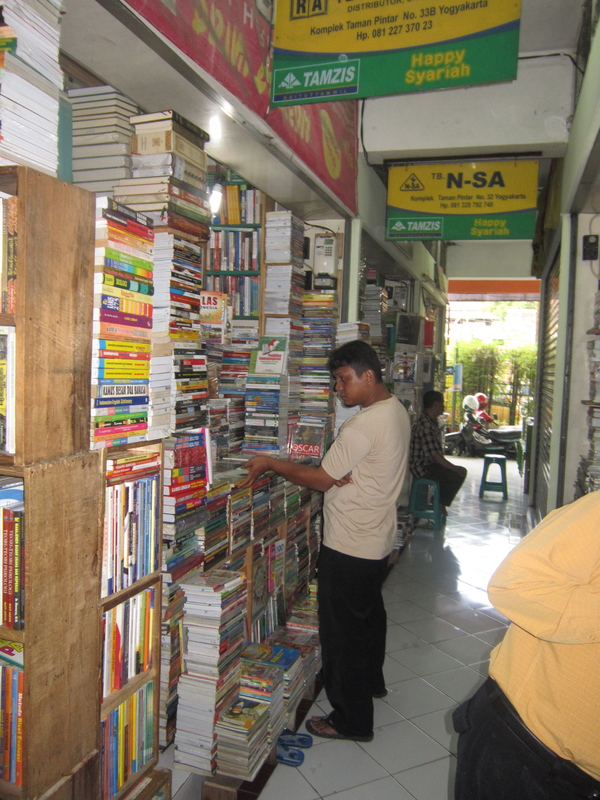 During my hunt for bridges, I found a cluster of bookshops with books all in Indonesian. I like books, but more than that, I love a local book-reading population. Strange? Well, there aren’t really book stores in LP. There’s one store and two book exchange places, but the books are, by and large, in English. As I browsed the collection of book stores, I heard music coming from the other end. 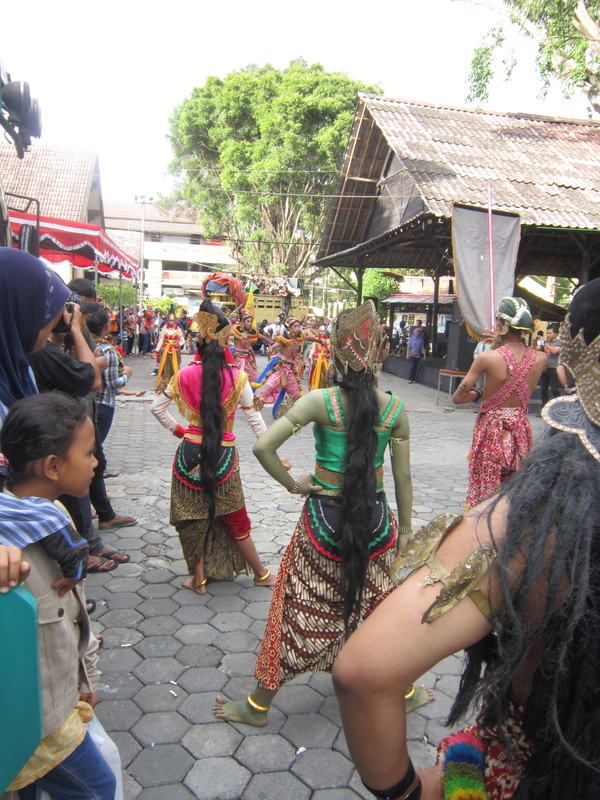 I followed the sound and ended up in the middle of a traditional dance performance. I stood and watched for a while then went back to the book place to find a dictionary to add to my collection. Is it weird that I collect dictionaries? Finally, I found bridges and more street art. My surroundings started to look familiar. I had wandered into the neighborhood where I had eaten dinner the night before. I passed a church and a few museums. 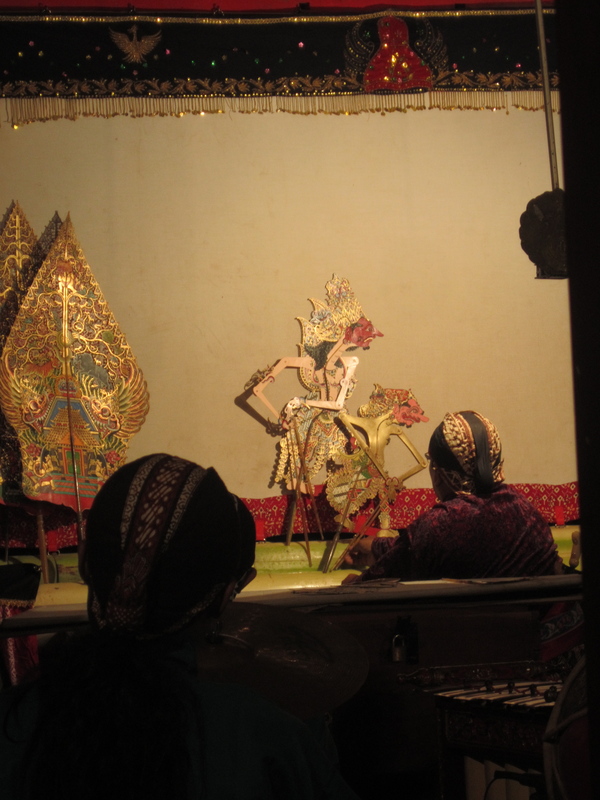 I saw a becak driver who turned out to be the man I sat next to at the wayang performance the night before. 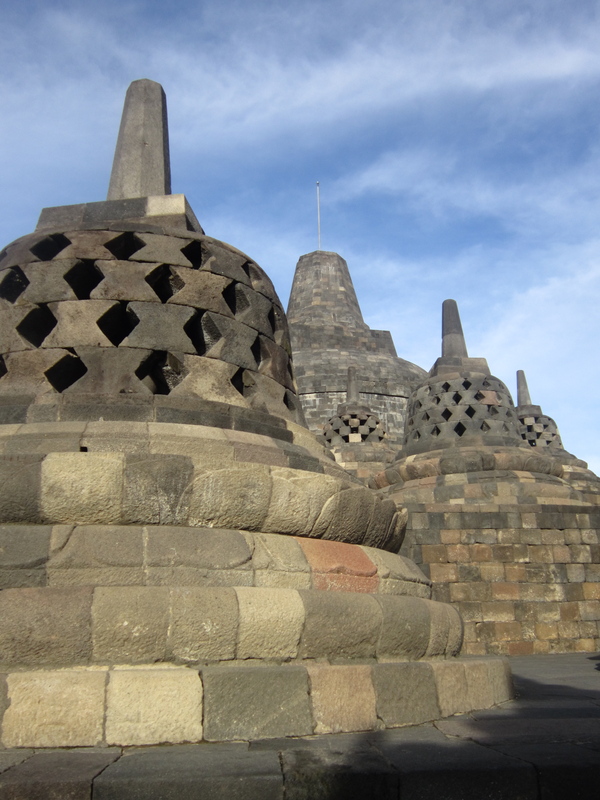 “Mau ke mana?” (Where do you want to go?) He seemed confused that I didn’t want to go anywhere. I told him, with the help of my dictionary, “Saya pergi berjalan-jalan.” With that, I was back in explorer mode. After a full day of walking, I was tired. 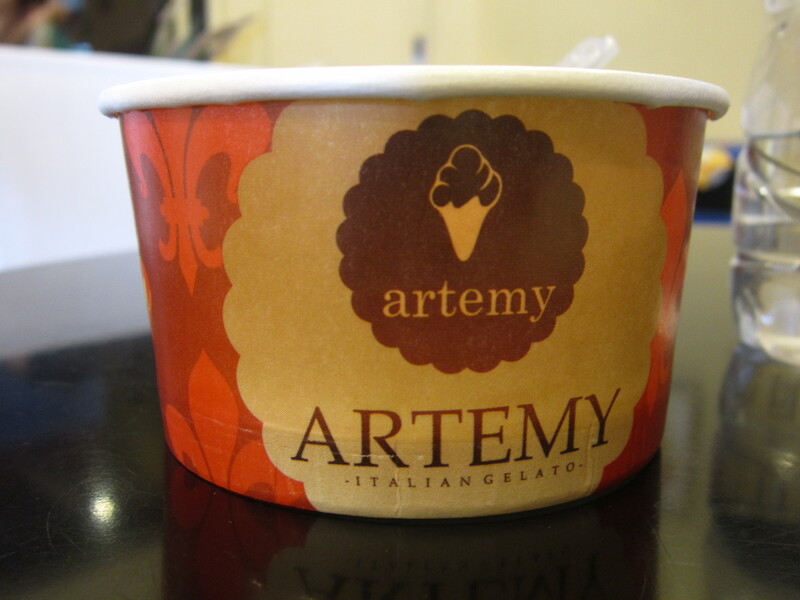 I had already checked out of my hotel and it was too early for dinner, though, so I had dessert first! I walked to an ATM after that to replenish my funds after buying that art in the afternoon and, of course, I noticed the song playing inside a nearby shop while I withdrew money. I walked back in the direction of food and stopped when I heard some guy on his guitar playing the same song I had just heard at the ATM. Decision made. 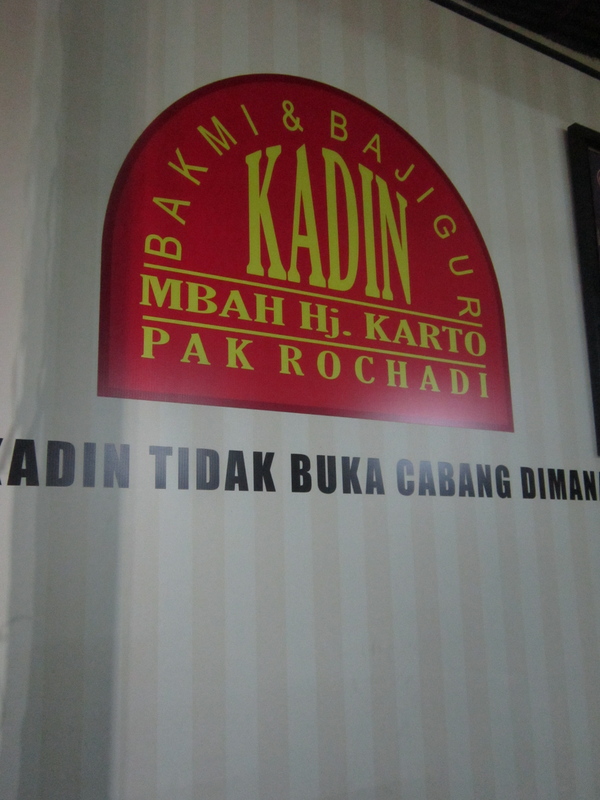 I ate there. Unfortunately, it was the end of the song and the guys were wandering entertainers. They came in and asked for donations before moving along to the next restaurant. I ordered my food and then asked the waitress if she knew the song they had played. She ran off and minutes later returned with the band! They gave an encore performance of the song, another customer helped me ask for the name of it, I gave them another donation and they vanished once more. Then dinner: cah kangkung (the veggie), nasi (rice), and ayam panggang (the chicken). You can be serenaded by the same song that I was by watching the video below! 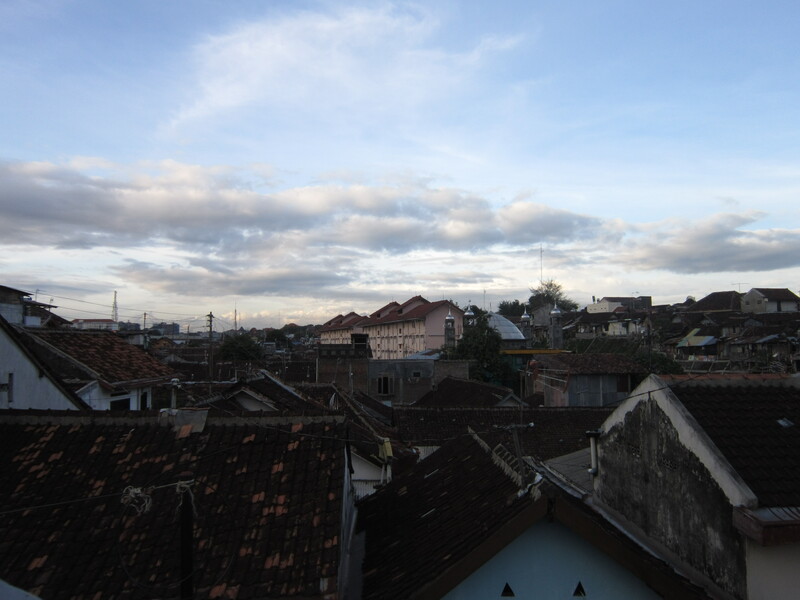 There’s not really much left to my Yogyakarta story after that. 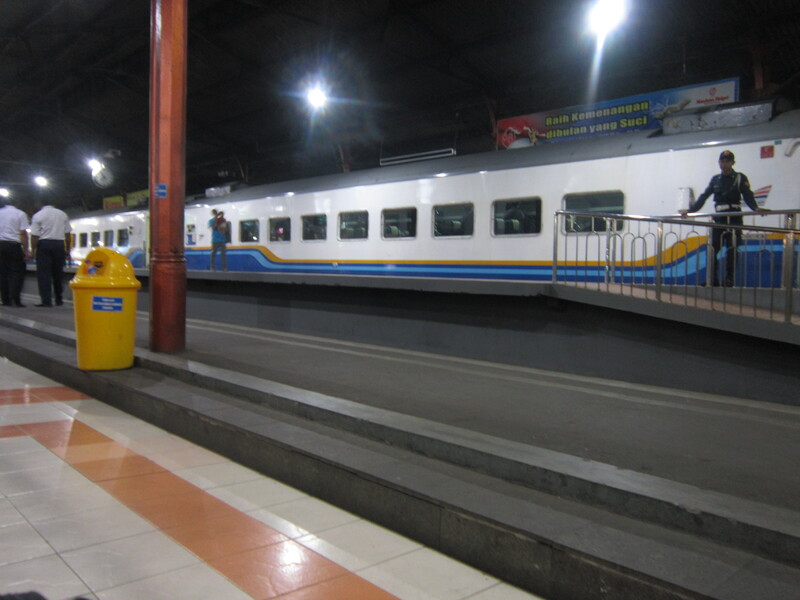 I picked up my luggage from my hotel and then walked across the street to catch the overnight train to Jakarta.